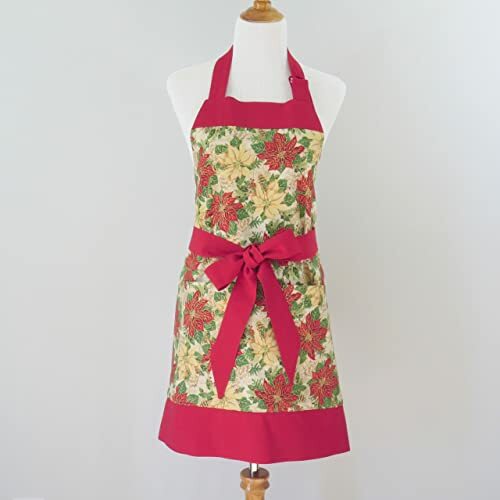 Women's Poinsettia Christmas Half Apron with Gold Trim Women's half apron in a beautiful deep red poinsettia and gold accent cotton print that would be perfect for holiday entertaining. A generous 3-inch wide waistband. 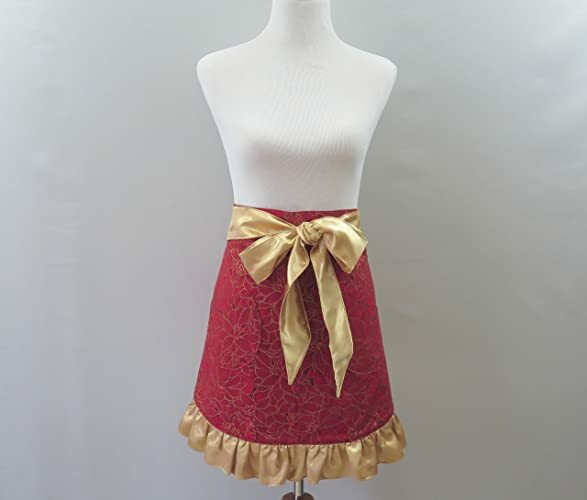 Waist ties and ruffled hem are made from a gold polyester "special occasion" fabric. 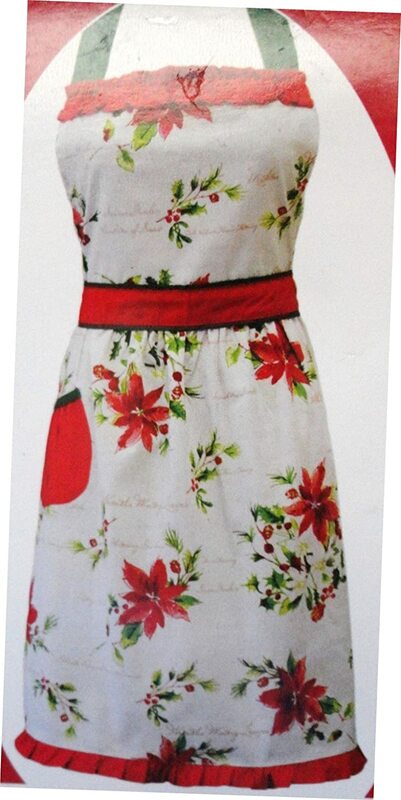 The ruffle on bottom extends all around to the back, making this a really cute, flirty apron. 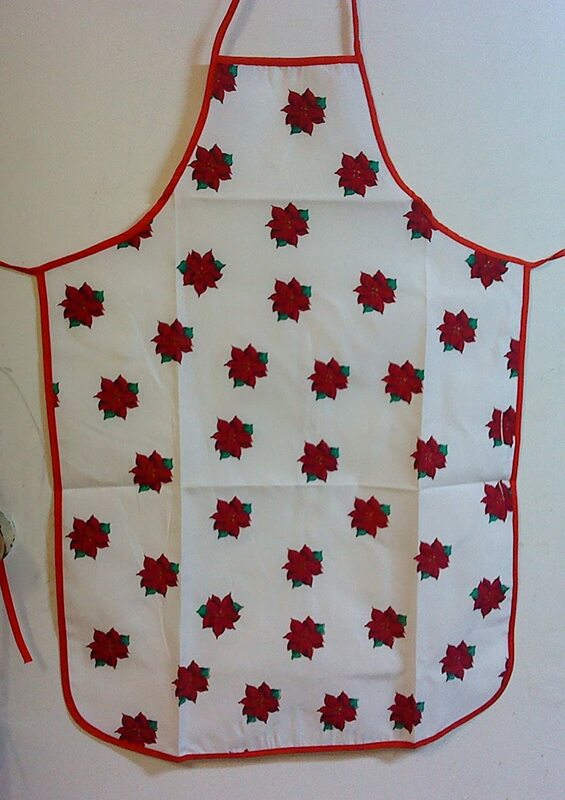 Fully lined (in solid red cotton). Two pockets and fully lined, including pockets. Three size options: Small/Medium (up to approx. size 12/14), Large (approx. size 14-18), X-Large (approx. size 18-22). See below under "Product Specifications" for more detailed sizing information. This is a "made to order" item, ready to ship in 11-15 days after purchase. The item pictured is not the item you will receive. 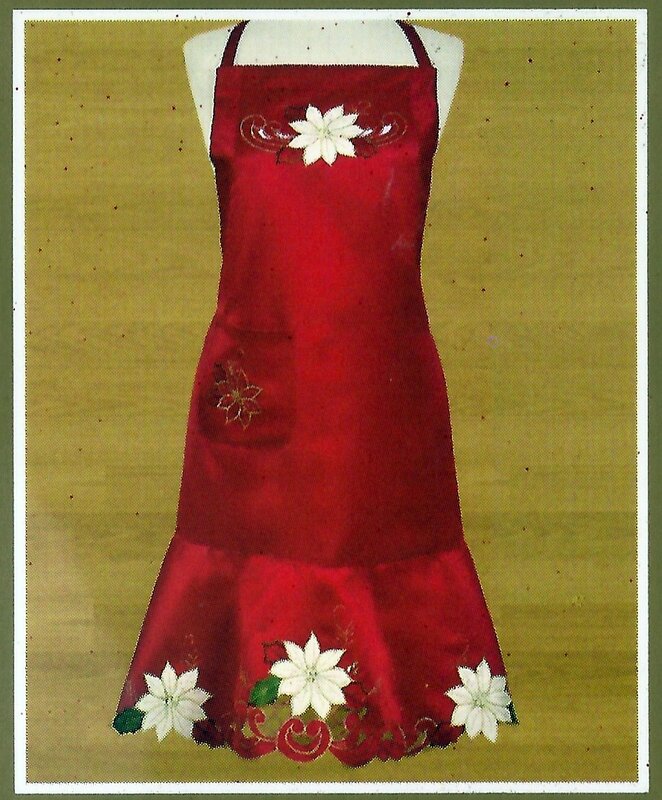 Pictures are representative and I will make your apron for you after you purchase this listing. It will be ready to ship to you in 11-15 days after you purchase this listing. The fabric used will be the same as shown in pictures, however, the fabric print/pattern placement will vary from the item shown. 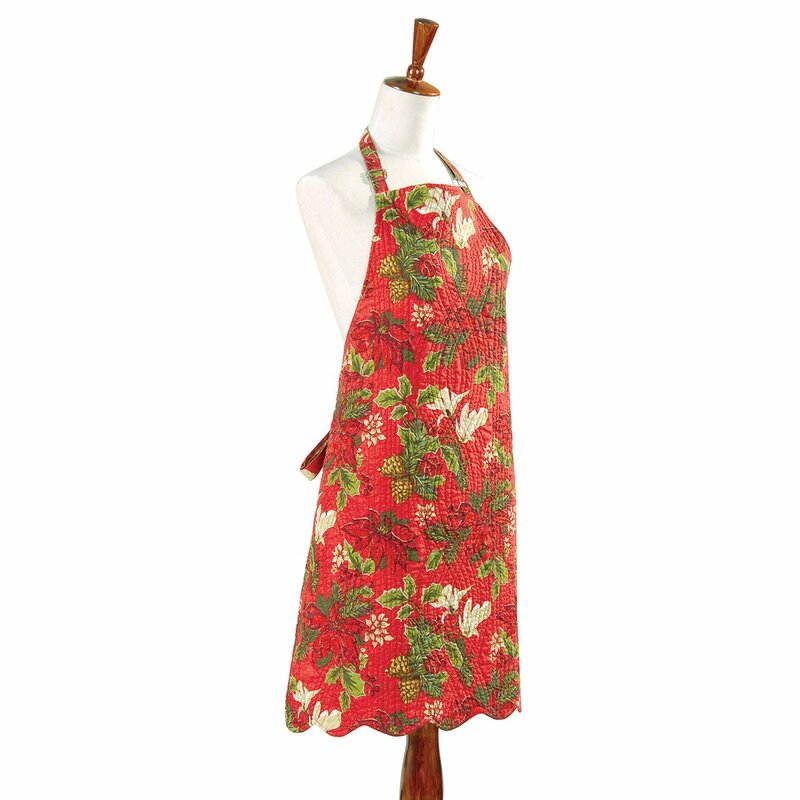 Brighten up your kitchen with this poinsettia ruffled apron. 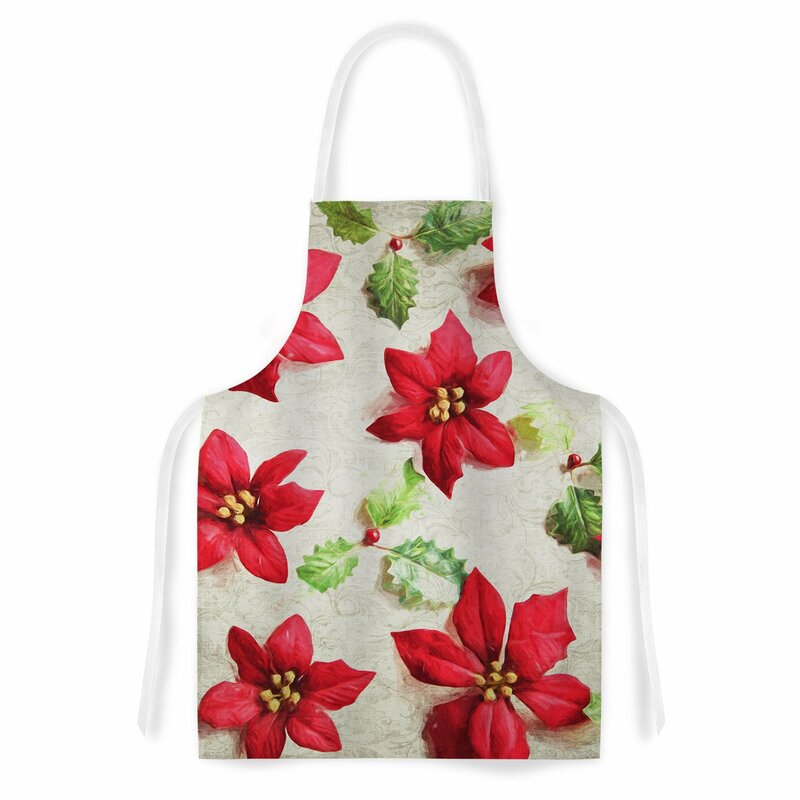 This apron will make you look and feel younger and provide a source of fun while making your favorite foods. Makes for a great present for the loved one in your life. 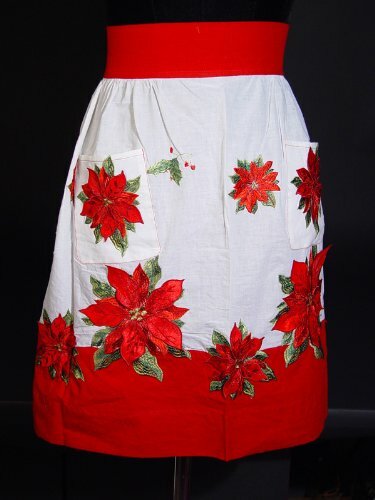 Tartan Plaid Skirt Ruffled border 100% Cotton Poinsettia design 26 x 28.5". 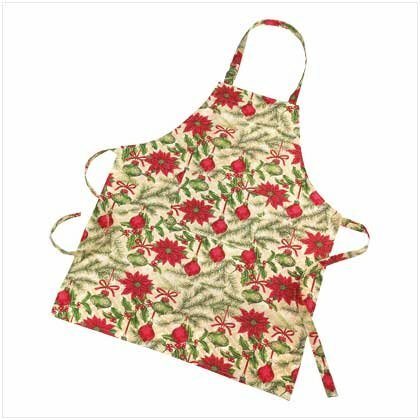 Katherine's Collection of fine holiday decorations presents this beautiful 20x35" (One size fits all) nostalgic Kitchen Apron features embroidered applique Poinsettia's - a must have for the holidays. Makes a great gift. 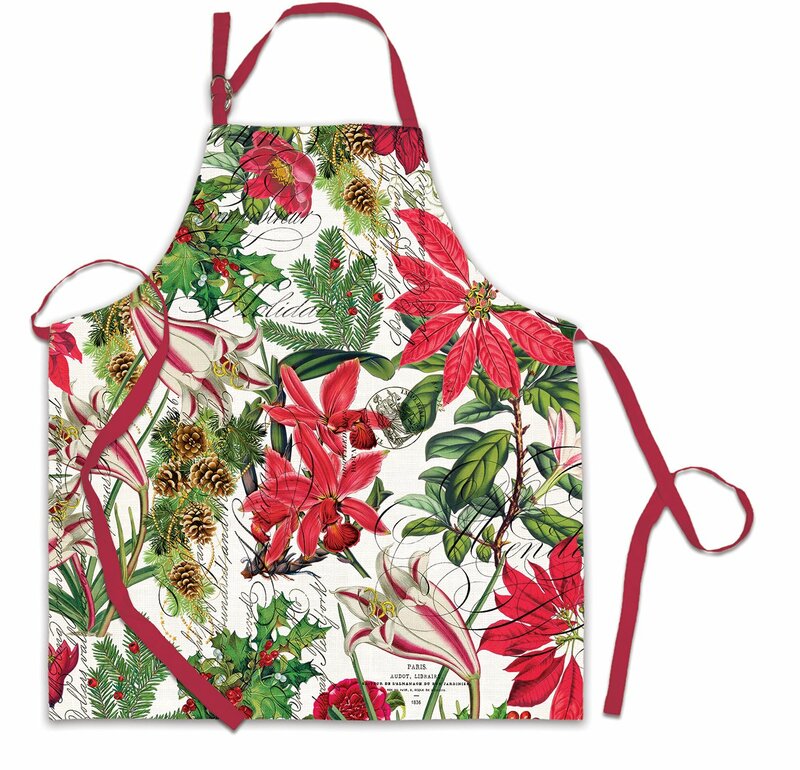 Women's Christmas/holiday chef apron made from a beautiful poinsettia print in red, cream, gold and green, 100% cotton. Ties, bib top band, bottom band and lining in a solid red 100% cotton. 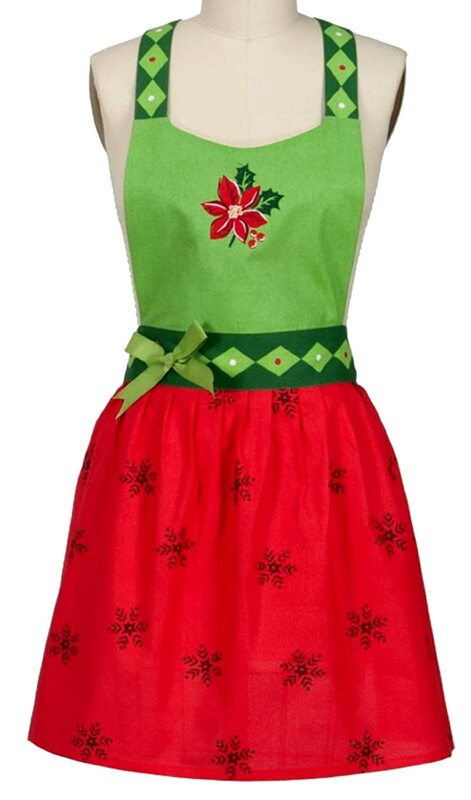 A festive, yet practical apron, with 4 or 5 large pockets that extend from side to side. 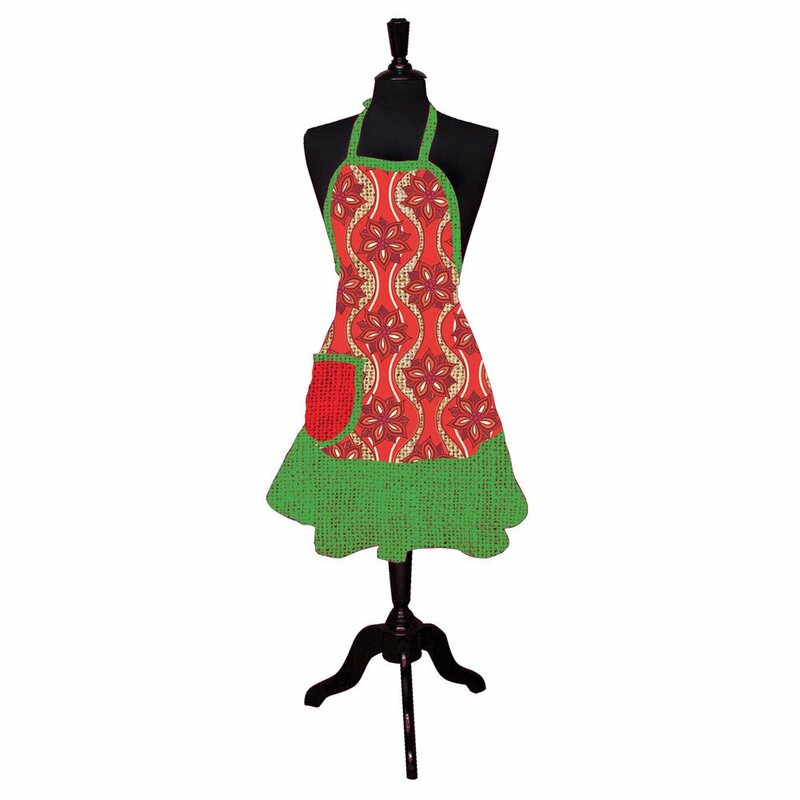 This apron style is fully lined, including pockets.Ties, bib top band, bottom band and lining in medium green 100% cotton. Adjustable "D" ring neck ties, slightly padded for a comfy fit. Fully lined, including pockets. 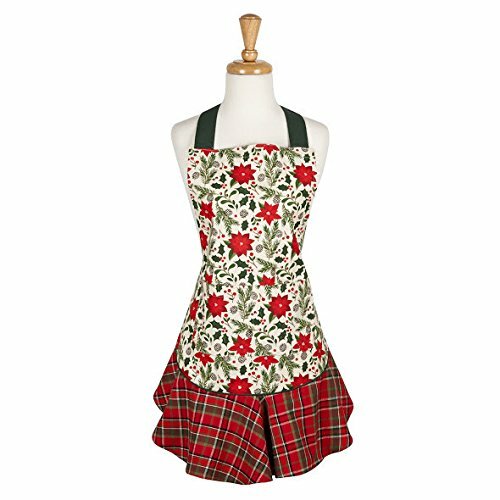 I like to line my aprons-it takes more fabric and time to sew, however, it makes the reverse side neat, gives the apron a nice weighty feel, and enhances durability. Choice of long or shorter waist ties. Optional personalization available. Three size options: Small/Medium (up to approx. size 14), Large (approx. size 14-18), X-Large (approx. size 18-22). See below under "Product Specifications" for more detailed sizing information. This is a "made to order" item, ready to ship in 16-20 days after purchase. The item pictured is not the item you will receive. 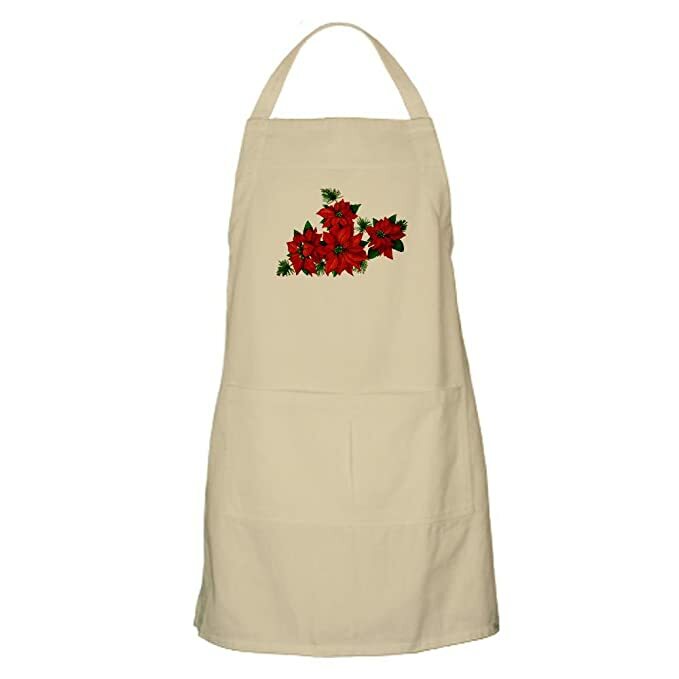 Pictures are representative and I will make your apron for you after you purchase this listing. It will be ready to ship to you in 16-20 days after you purchase this listing. The fabric used will be the same as shown in pictures, however, the fabric print/pattern placement will vary from the item shown. When decorating for the holidays don't forget to treat yourself to a little fun too! 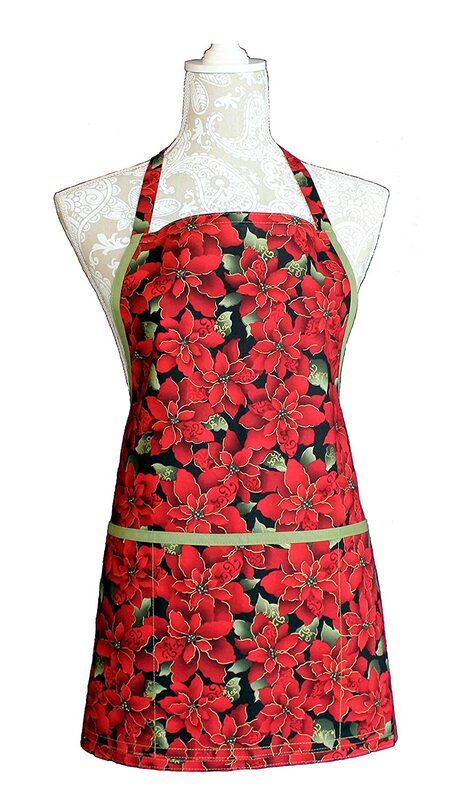 Pretty poinsettia and holly print apron is a festive accessory for any aspiring chef. Cotton. Machine wash warm; tumble dry warm. 24 x 34 long. Manufactured to the Highest Quality Available. Design is stylish and innovative. Satisfaction Ensured. Great Gift Idea.